All types of unwanted malicious software installed onto your computer device without your absolute consent. Most home users know about viruses, and have a Computer Virus Removal (Opens New Window) program installed for protection. However, this is just one type of Malware. Others types have exotic names like Trojan Horses, Worms and Adware. Each type has different malicious intent which is explained below. However, from 2014 it is correct to say new Malware is written by cyber criminals to sit in the background on your device and covertly collect your data. When you think about the explosion of social media in particular you are creating more personal data now than ever before. Cyber Criminals can steal and sell your identity on the dark web or hold you to ransom! Ransomware can cause a lot of damage. The WannaCry Ransomware Attack (Opens New Window) in My 2017 is a prime example of this, and it remains the largest cyber attack in history. Malware written to cause disruption to your machine is generally on the decline. Do you have any stories or experiences of Malware? How did you remove it? Did you lose any data? Please Submit Your Story Here. Review about Other Visitors Experiences. Any of them sound familiar? Viruses: Written to secretly spread from one PC to another, damaging or deleting system files until your PC stops working. Trojan: Written to cause damage like viruses but disguised as legitimate software. A virus replicates itself. A Trojan does not. Rootkits: Gives cyber criminals admin access and makes their malicious programs more difficult to discover and remove. Worms: Spread by opening spam e-mail/attachments, sending everyone in your address book a variety of unacceptable messages. Spyware: Secretly installed to capture your keystrokes, e.g. online bank access details, and sent to cyber criminals. Crimeware: Written to replicate identity theft online, e.g. using your credit card for repeat transactions without you knowing. Adware: Program that watches the web sites you visit and targets 'relevant' but unwanted adverts to your PC. Ransomware: Blocks access to your device until you pay the criminal money for a code to unblock. Often you don't get the code and data is wiped your machine. There are other types of Malicious programs in cyber space. According to McAfee there is over 70 million different active programs on the Internet at the time of writing. With 2 million new Malicious programs written every month and billions of spam e-mails being sent every day, this is BIG business! This form of software affects how your PC performs and makes your machine an unacceptable security risk to you and your family. Therefore, this section looks at how to prevent Malware from getting onto your machine, and if you are unlucky, how to clean it from your machine. Anti Malware software looks at the different types of software written to remove nasty programs and protect your PC. There are commercial programs, free software and web sites that remove Malware online. A guest publication written by Ken Wilson, a Tech Guru and Security Specialist, provides tips on how to keep safe from dangerous security threats. Take a look at the best computer protection page for details. There are also rogue Malware programs that damage your machine as discussed above. You can avoid these nasty programs with a few simple techniques. Popups are a source of malware programs. Thomas Milva, an IT Security Analyst, Web Entrepreneur, Tech Enthusiast and Editor, writes about popups and how to prevent the damage they can cause in his guest publication called computer protection security. Free Malware removal looks at some of the popular free Malware software programs. How do you know which ones are the best? How do they match up against some of the commercial programs? 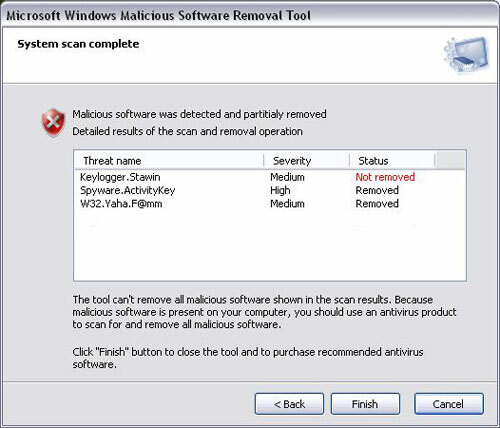 Free Malware Scan looks at other 'stealth' Malware removal tools such as the McAfee Stinger. There are also web sites that report to remove nasty programs from your PC's. Can they be trusted? Find out here. Malware Bytes is arguably one of the best Malware removal programs available. Part 1 of the tutorial series Malwarebytes Download (Opens New Window) looks at how to download and install the program. Part 2 Malwarebytes Anti Malware (Opens New Window) looks at how to use the program to the best of your advantage. Microsoft developed the Microsoft Malware Removal Tool (Opens New Window) to help prevent nasty programs attacking their Operating Systems. This is a free stealth removal tool. This section looks at how to obtain and apply the malicious software removal tool which is updated by Microsoft on a monthly basis. Malware causes lots of problems for home users like us. However, we can minimise the risk of infection by following the good practices of a typical computer support professional. The main thing is not to worry too much. Malicious software is avoidable most of the time, and if you do contract an infection, there are lots of tools available to help you remove it cleanly. The security of your home devices such as your PC, Laptop, iPad or mobile phone is improved by reading through and applying the recommendations in this section. Had A Bad Experience With Malware? What was your experience? What did the Malware do to your computer? Have you lost money or had your identity stolen, for example? What do you do to get rid of Malware on your computer? Do you backup your files? Have you had to rebuild your computer? Enter Your Title e.g. "Backup Your Data Now!"